કોથમીર (અંગ્રેજી: Coriander, હિંદી: धनिया, વૈજ્ઞાનિક નામ: Coriandrum sativum) એ વૈજ્ઞાનિક વર્ગીકરણ પ્રમાણે એપિએસી કુળમાં આવતી એક વર્ષાયુ વનસ્પતિનો છોડ છે. કોથમીર દક્ષિણ યુરોપ અને ઉત્તર અમેરિકાથી નૈઋત્ય એશિયાની વતની છે. કોથમીરનો છોડ મૃદુ, નાજુક, લીસ્સી ડાંડીવાળો હોય છે અને આશરે ૫૦ સે.મી. (૨૦ ઇંચ) જેટલો ઉંચો હોય છે. તેના પર્ણો વિવિધ આકારનાં, પહોળા, ચપટા પર્ણદંડ વાળા અને પીંછાકાર હોય છે. પૂષ્પો નાનાં છત્ર પૂષ્પવિન્યાસમાં ગોઠવાયેલાં હોય છે, જે મહદંશે સફેદ અને ક્યારેક આછી ગુલાબી ઝાંયવાળા, અનિયમિત તથા બે પ્રકારની પાંખડીઓ ધરાવતા હોય છે. ૧-૩ મિ.મી.ની નાની પાંખડીઓ પૂષ્પદંડ તરફ અને ૫-૬ મિ.મી. લંબાઈની પાંખડીઓ તેનાથી દૂર ફેલાયેલી હોય છે. ફળ ૩-૫ મિ.મી. નાના ગોળ દાણાનાં આકારનું અને શુષ્ક હોય છે. કોથમીરનાં છોડનાં બધાજ ભાગો ખાદ્ય છે, પરંતુ તેના લીલાં પાન અને સૂકા બીજ/ફળોનો રસોઈમાં સવિશેષ ઉપયોગ થતો આવ્યો છે. કોથમીર ભારતીય, મધ્ય એશિયા, મધ્ય પૂર્વ, ભૂમધ્ય પ્રદેશ, દક્ષિણ એશિયા, મેક્સિકો, લેટિન અમેરિકા, ચીન, આફ્રિકા અને અગ્નિ એશિયાની વાનગીઓમાં સામાન્યપણે જોવા મળે છે. એના પાનને વિવિધ ભાષામાં કોરીએન્ડર લીવ્સ, ચાઇનીઝ પાર્સલી અને સીલેન્ત્રો તરીકે ઓળખાય છે. કોથમીરને કુલાન્ત્રો સમજીને થાપ ન ખાવી જોઈએ. કુલાન્ત્રો(Eryngium foetidum)એ કોથમીરના કુળની નજીકનો જ પણ અન્ય છોડ છે. આ છોડના પાનનો દેખાવ જુદો હોય છે અને તેના પાન વધુ તીવ્ર સુગંધી તેલ ધરાવે છે..
દાણા કરતાંં પાંદડાનો સ્વાદ થોડો ભિન્ન હોય છે, તેમાં હલ્કી ખટાશનો અનુભવ થાય છે. અમુક લોકોને તે સ્વાદ સાબુ સમાન કે સડનને લાગતો અપ્રિય લાગે છે અને તેઓ પાંદડા વાપરતા નથી. The flavours have also been compared to those of the stink bug, and similar chemical groups are involved (aldehydes). 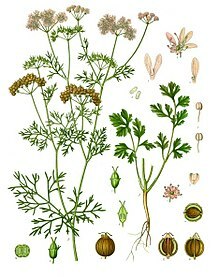 Belief that aversion is genetically determined may arise from the known genetic variation in taste perception of the synthetic chemical phenylthiocarbamide; however, no specific link has been established between coriander and a bitter taste perception gene. The fresh leaves are an ingredient in many South Asian foods (particularly chutneys), in Chinese dishes and in Mexican dishes, particularly in salsa and guacamole and as a garnish. Chopped coriander leaves are a garnish on cooked dishes such as dal and curries. As heat diminishes their flavor quickly, coriander leaves are often used raw or added to the dish immediately before serving. In Indian and Central Asian recipes, coriander leaves are used in large amounts and cooked until the flavor diminishes. The leaves spoil quickly when removed from the plant, and lose their aroma when dried or frozen. Fresh coriander leaves, known as кинза (kinza) in Russian (from Georgian ქინძი), are often used in salads in Russia and other CIS countries. The dry fruits are known as coriander seeds, coriandi seeds, or, in South Africa, dhania. The word coriander in food preparation may refer solely to these seeds (as a spice), rather than to the plant itself. The seeds have a lemony citrus flavour when crushed, due to terpenes linalool and pinene. It is described as warm, nutty, spicy, and orange-flavored. It is commonly found both as whole dried seeds and in ground form. Seeds can be roasted or heated on a dry pan briefly before grinding to enhance and alter the aroma. 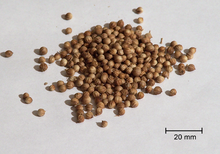 Ground coriander seed loses flavor quickly in storage and is best ground fresh. Coriander seed is a spice (Hindi name: धनिया dhania), in garam masala and Indian curries, which often employ the ground fruits in generous amounts together with cumin. It acts as a thickener. Roasted coriander seeds, called dhana dal, are eaten as a snack. It is the main ingredient of the two south Indian dishes: sambhar (சாம்பார்) and rasam (இரசம்). Coriander seeds are boiled with water and drunk as indigenous medicine for colds. Coriander seeds are used in brewing certain styles of beer, particularly some Belgian wheat beers. The coriander seeds are used with orange peel to add a citrus character. કોથમીરનાં મૂળમાં તેનાં પર્ણો કરતાં પણ વધુ ગહેરી અને તિવ્ર સુવાસ હોય છે. મૂળનો ઉપયોગ અનેક એશિયન વાનગીઓમાં થાય છે, મોટે ભાગે થાઈ વાનગીઓમાં, ખાસ કરીને સુપ્સ અને શાકમાં તેને વાટીને નાખવામાં આવે છે. Coriander grows wild over a wide area of the Near East and southern Europe, prompting the comment, "It is hard to define exactly where this plant is wild and where it only recently established itself." Fifteen desiccated mericarps were found in the Pre-Pottery Neolithic B level of the Nahal Hemel Cave in Israel, which may be the oldest archeological find of coriander. About half a litre of coriander mericarps were recovered from the tomb of Tutankhamun, and because this plant does not grow wild in Egypt, Zohary and Hopf interpret this find as proof that coriander was cultivated by the ancient Egyptians. The Bible mentions coriander in Exodus 16:31: "And the house of Israel began to call its name Manna: and it was round like coriander seed, and its taste was like that of flat cakes made with honey." Coriander seems to have been cultivated in Greece since at least the second millennium BC. One of the Linear B tablets recovered from Pylos refers to the species as being cultivated for the manufacture of perfumes, and it appears that it was used in two forms: as a spice for its seeds and as a herb for the flavor of its leaves. This appears to be confirmed by archaeological evidence from the same period: the large quantities of the species retrieved from an Early Bronze Age layer at Sitagroi in Macedonia could point to cultivation of the species at that time. These herbs are used where they grow in much the same way as cilantro is used. Eryngium foetidum has a similar taste and is also known as culantro. Found in South America. Persicaria odorata, is commonly called Vietnamese coriander, or ram rau. The leaves have a similar odour and flavour to coriander. It is a member of the Polygonaceae, or Buckwheat Family. .
Papaloquelite is one common name for Porophyllum ruderale subsp. macrocephalum, a member of the Compositae or Asteraceae, the Sunflower Family. This species is found growing wild from Texas to Argentina. .
ધાણા ધાણા એ તુરા, સહજ, તીખા, કડવા, મધુરુ , સ્વાદિશ્ટ, સુગ્નધિત, પાચ્ય મધુરુ , ઠંડા, પચવામા હલકા, સ્નિગ્ધ, હ્રુદય માટે હિતકર, આન્તરિક માર્ગોની શુદ્ધિ કરનાર, જઠરાગ્નિ પ્રદિપ્ત કરનાર, આહાર પર રુચિ કરનાર, પાચન કરનાર, મળને બાધંનાર, મુત્ર પ્રવ્રુતિ વધારનાર, વીર્ય માટે અહિતકારી, તરસ શમાવનાર, ત્રણે દોષો શમાવનાર, આન્ખો માટે સારા, તરસ, બળતરા, દમ, ઉધરસ, ઊલટિ,ઉબકાના શમન કરનાર છે. તાવ મટાડનાર, મળને રોકનાર અને ત્રિદોષનાશક છે. ધાણા અને સાકર પેટની બળતરા-એસિડિટિ માટે ઉત્તમ ઔષધ છે. Chemicals derived from coriander leaves were found to have antibacterial activity against Salmonella choleraesuis, and this activity was found to be caused in part by these chemicals acting as nonionic surfactants. Coriander has been used as a folk medicine for the relief of anxiety and insomnia in Iran. Experiments in mice support its use as an anxiolytic. Coriander seeds are used in traditional Indian medicine as a diuretic by boiling equal amounts of coriander seeds and cumin seeds, then cooling and consuming the resulting liquid. In holistic and traditional medicine, it is used as a carminative and as a digestive aid. Coriander has been documented as a traditional treatment for diabetes. A study on mice found that coriander extract had both insulin-releasing and insulin-like activity. Coriander seeds were found in a study on rats to have a significant hypolipidemic effect, resulting in lowering of levels of total cholesterol and triglycerides, and increasing levels of high-density lipoprotein. This effect appeared to be caused by increasing synthesis of bile by the liver and increasing the breakdown of cholesterol into other compounds. વિકિમીડિયા કૉમન્સ પર Coriandrum sativum વિષયક વધુ દ્રશ્ય-શ્રાવ્ય માધ્યમો (Media) ઉપલબ્ધ છે. Wallstreet Journal article covering people's strong feelings about cilantro/coriander (February, 2009). NPR story about how people taste cilantro/coriander (December, 2008). New York Times column The Curious Cook on Cilantro (April, 2010). ↑ Tucker, A.O. & T. DeBaggio. 1992. Cilantro Around The World. The Herb Conpanion. Ap.-May. pgs 36-41. ↑ ધાણા એ ઘણા મસાલા એન્ટીઑકિસડન્ટ(antioxidants) જેવા છે, કે જે વિલંબ અથવા આ મસાલા સાથે અનુભવી ખોરાક બગાડ અટકાવી શકે છે. એક અભ્યાસ બંને પાંદડા અને બીજ એન્ટીઑકિસડન્ટોના સમાવે મળી છે, પરંતુ પાંદડાઓ એક મજબૂત જોવા મળી હતી. (Helle Wangensteen, એન Berit Samuelsen, કાર્લ Egil Malterud, "ધાણા તારવેલા માં એન્ટીઑકિસડન્ટ પ્રવૃત્તિ", ફૂડ કેમિસ્ટ્રી, વોલ્યુમ. 88, નં 2, પૃષ્ઠથી પૃષ્ઠ 293-297, નવેમ્બર 2004]. </ Ref> Helle Wangensteen, Anne Berit Samuelsen, Karl Egil Malterud, "Antioxidant activity in extracts from coriander", Food Chemistry, Vol. 88, No. 2, pp. 293-297, Nov. 2004. ↑ Isao Kubo et. al., "Antibacterial Activity of Coriander Volatile Compounds against Salmonella choleraesuis", J. Agric. Food Chem., 2004, 52 (11), pp 3329–3332. ↑ Dawakhana, H (2007). "Coriander: Cure from the Kitchen". hashmi.com. Retrieved 2007-07-18. ↑ "Coriander". PDRHealth. Retrieved 2007-07-18. ↑ "Herbs for the Prairies:Coriander". Saskatchewan Herb and Spice Association. Retrieved 2007-07-18. ↑ V. Chithra and S. Leelamma, "Hypolipidemic effect of coriander seeds (Coriandrum sativum): mechanism of action", Plant Foods for Human Nutrition (Formerly Qualitas Plantarum), Vol. 51, No. 2, pp. 167-172, June, 1997. આ પાનાંમાં છેલ્લો ફેરફાર ૧૫ માર્ચ ૨૦૧૯ના રોજ ૦૮:૪૬ વાગ્યે થયો.